Improved pedalling performance. With its large, ergonomically shaped surface the new EP-1 pedal hugs the sole of your feet and ensures the optimum transmission of power. In the case of conventional pedals the foot only comes into contact with specific points and is distorted in the longitudinal direction because of the short surface of the pedal. However, with its large contact surface the EP-1 gives full support to the sole of the foot. This also ensures that problems such as numbness or pains in the foot do not arise in the first place. On the large, anatomically shaped, non slip contact area the foot is able to find its ideal position, which if necessary can be individually adjusted for the left and right foot. The inner guide rails ensures perfect positioning and prevents any contact between the foot and the crank. The use of a short axle reduces the Q factor (the distance between the two pedals). This means that the foot-knee-hip joint sequence is aligned correctly with the axle. As is the case with ergonomic handlebar grips you will notice the gain in efficiency and comfort immediately. Having fallen off my bike last summer whilst clipped in I seriously damaged my shoulder. 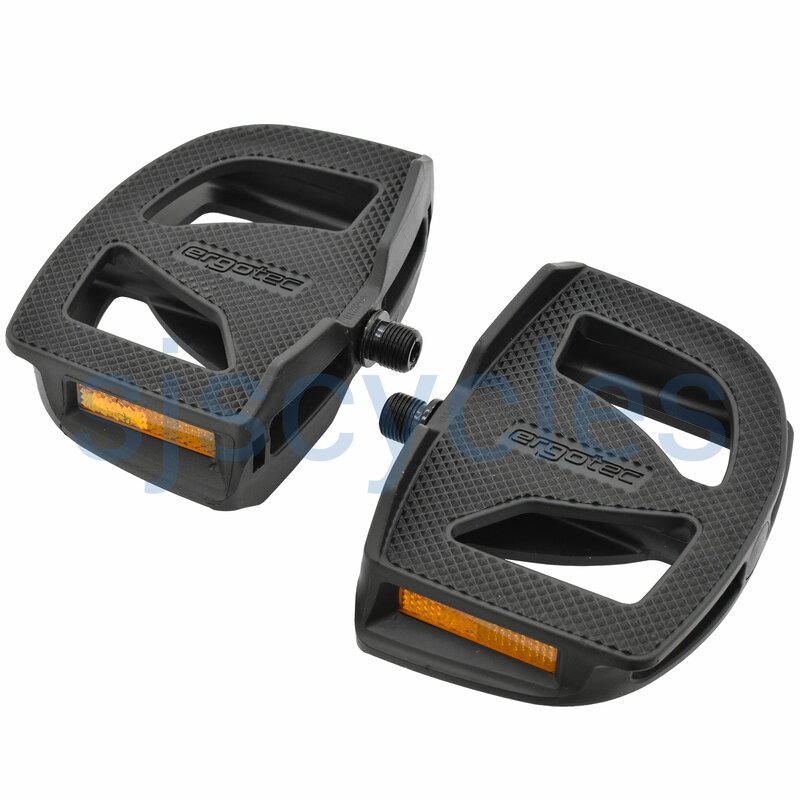 I have been using these pedals ever since, being concave they hold your foot firmly, without being clipped in and are very comfortable, as are Humpert handlebars. Upon receipt of these pedals the spindle was too tight on the bearings. Prising off the plastic end cap revealing the top nut(9mm size box spanner I used if memory serves correctly) deep in the body, a 6mm alan key held pedal in worktop vice, readjustment made with a thin screw driver to adjust the bearing nut, and so running freely. Inevitable slight damage to plastic end cap. Apologies if my earlier question was unclear but what I was trying to ascertain is whether The Torn Raven Catalyst has a 9\16" crank thread in order to be compatible with the 9\16" pedals I'm considering ordering? It depends on the crank in particular, but as far as I know, all Thorns have been fitted with 9/16" cranks. Please can you advise whether or not the axle thread size of 9/16" of these pedals is compatible with the crank thread of my Thorn Raven Catalyst bike. Yes these pedals have a 9/16" axle thread. Which Shoes Would Be Best To Wear With This Pedal? Unfortunately toe/wheel overlap is unavoidable on a lot of shorter wheelbase bikes especially road bikes. Different pedals/ toe clips/ shoes may help, but all only by small amounts and may compromise the most comfortable pedalling position.